The weather is dramatically cooler and we have had our first snow. After a warm weekend over the next couple of days, we are facing a week of serious cold and predicted snowfall. We had the first hard freeze, near 20 degrees. We harvested all the tomatoes, tomatillos and peppers which are ripening all over our kitchen. Our salad greens are doing fine. We are still harvesting lettuce, curly blue/green and burgundy kale, spinach, mild mustard greens, curled and flat parsley, rainbow chard, garlic chives, carrots and peas. While we have only picked a few pea pods, the entire pea plant is edible and we have been adding leaves and shoots to our salads. Hunting season was a success. With a deer added to our garden produce, our deep freeze is packed with the overflow filling the fridge freezer in the kitchen. I did not bring home an elk, but the deer is enough red meat for the 2 of us during the coming year. I still consider my elk hunt a success. 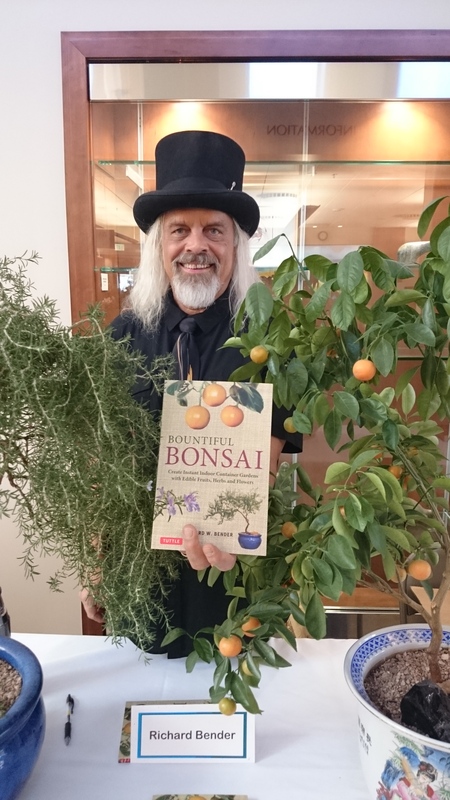 It was a busy week for me that included 2 book signing events for Bountiful Bonsai that limited my time in the woods to only 3 of 9 days in the season. I hunted in fresh snow, up to knee deep for those 3 days. I found a great new place to hunt with plenty of tracks, droppings and rubs. I felt close to elk but just not in the same time, same place. With more time to hunt I’m sure the outcome would have been different. Now that hunting season is essentially over, it is wine season for me. I signed a contract last month to write the book, Craft Wines for Story Press. I have until August 1 to write the manuscript and have several new wines I plan to make as well as write about for the book. At last count, I have 138 different wines to write about for the book. Most recently, we pressed out Burgundy Kale, Plum Rhubarb and Orange Ghost wines. Hot pepper/citrus wines are always a favorite among my wine drinking friends. There are more than 30 different hot pepper/citrus wines in the cellar. I always look for new hot peppers with interesting names to use in wines. 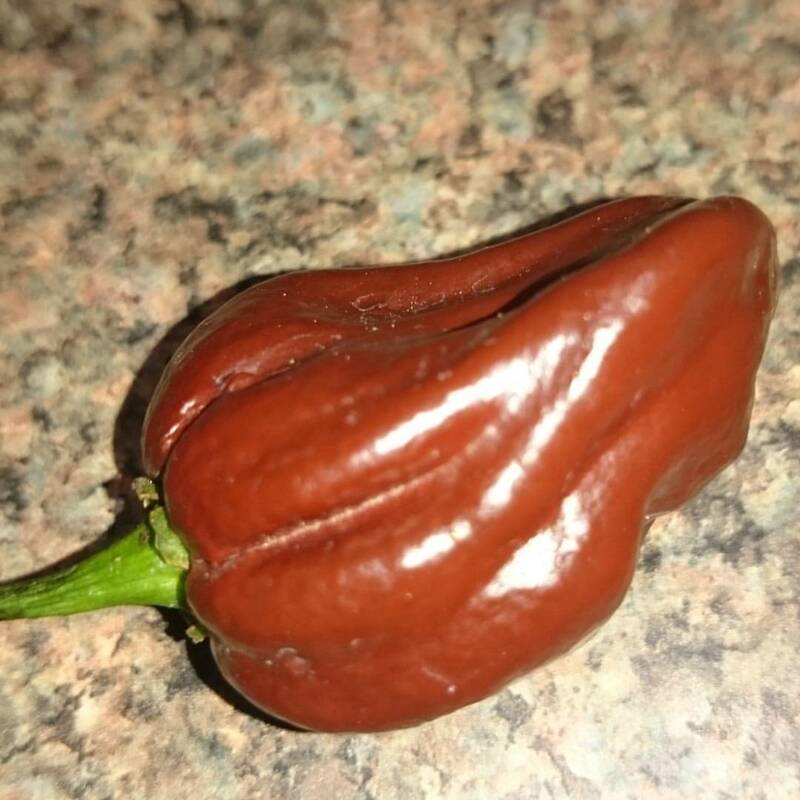 This last summer I grew chocolate habaneros to be paired with Mandarin oranges and cocoa bean hulls as well as a pepper called brainstrain which will become Tangerine Brainstrain. I’ve already ordered seeds of 2 new pepper varieties to grow next year, Count Dracula and Volcano. I also plan to make a Chocolate Almond Cherry wine this winter. It has been a warm and dry fall until just recently, but the season has definitely begun to change. The days are shorter and the nights are cool. My outdoor activities have changed focus. 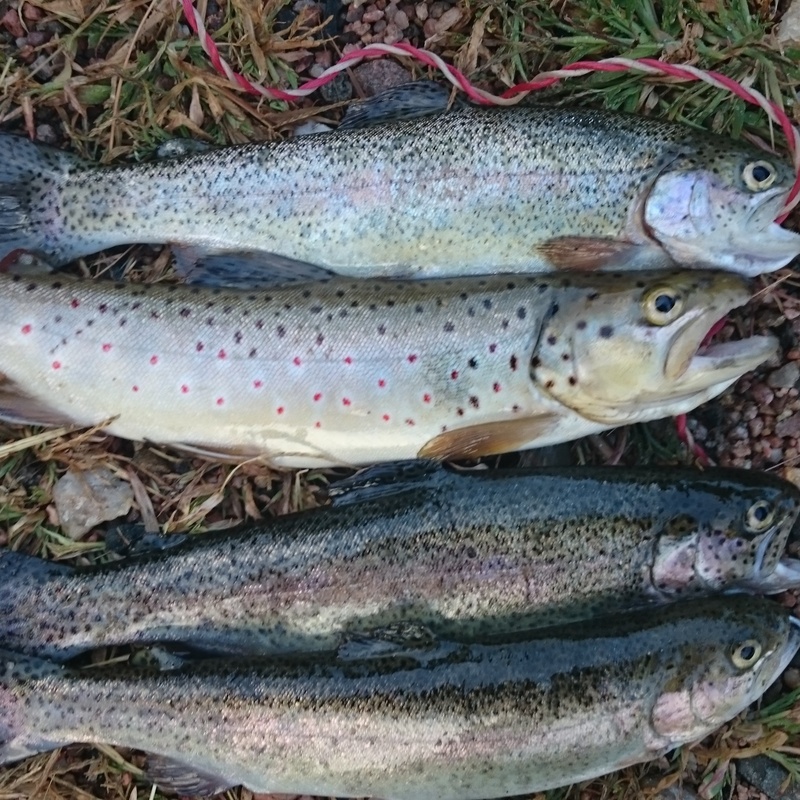 The trout pictured above are from my last fishing trip on the Cache la Poudre river a couple weeks ago. Two were caught on a hopper dry fly and two were caught on a tiny #20 nymph dropper off of that large grasshopper dry fly. They will be smoked on the grill soon. Fall has me switching time to hunting rather than fishing. I didn’t draw a deer tag this year so I had to buy a leftover tag in an area I had never hunted before. I went scouting there a few days before the season opened. 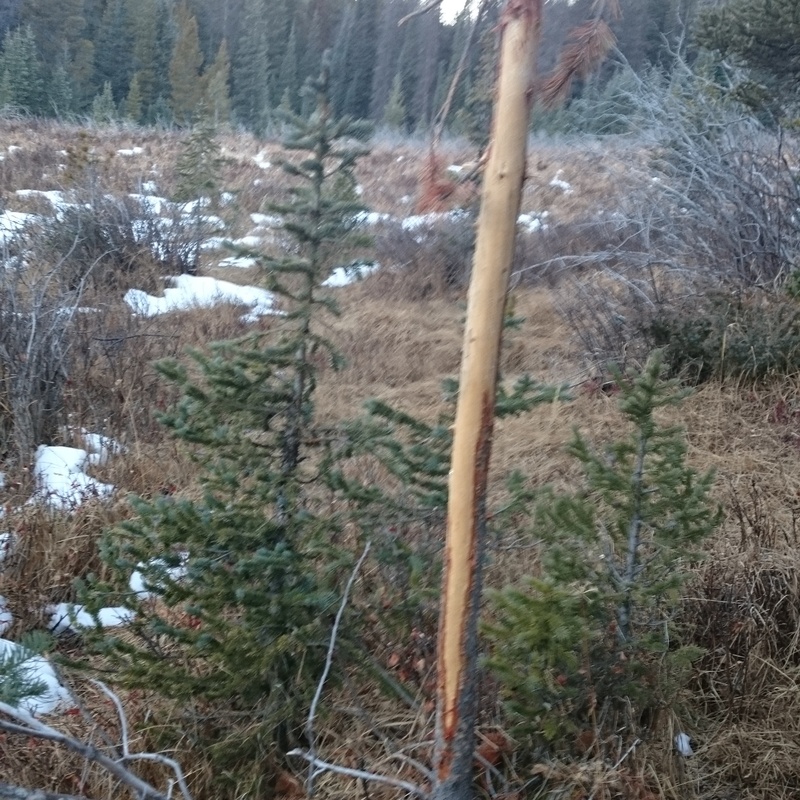 I didn’t see any deer and found some sign, including a couple fresh rubs which was important as I had a buck tag, but not near as much deer sign as I am used to seeing in my regular hunting area. I carried my shotgun and did bring home a rabbit. Opening day was predicted to be unseasonably warm, although it was plenty cold before sunrise, about 36 degrees. There were several other cars parked at my spot when I arrived, letting me know there would be other hunters in the area. I was in place, before legal shooting time, watching those fresh rubs for the first couple of hours that morning. I saw no deer, but did see several other hunters move through the area. Before the day was through I would see 10 hunters, including a party of 5 that were hunting together. 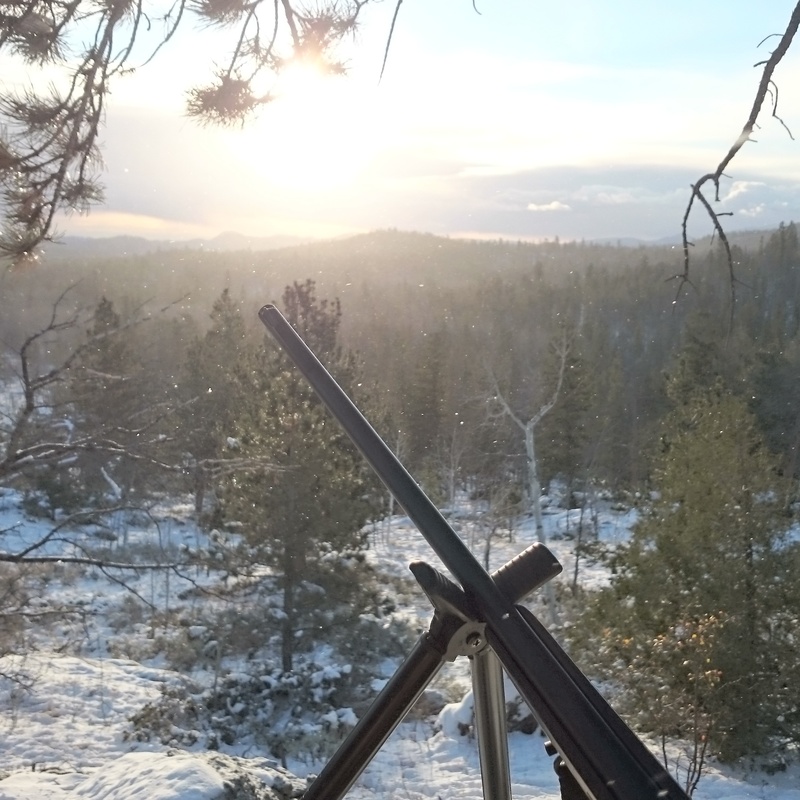 With no early activity around those rubs, I began exploring, still hunting and stopping to watch promising areas, taking time to sip coffee and eat some snacks while sitting. I continued to see other hunters, but no deer and very little wildlife other than a couple rabbits and some birds. At one point, while in deep woods I heard strange sounds from what had to be a flock of birds flying overhead. I never did see them, but knew that sound. It had to be a large flock of sandhill cranes. That was confirmed when I heard from several friends later that day that they had seen large flocks migrating overhead along the Front Range. By midafternoon I had seen no deer, but plenty of hunters. I was beginning to think it might be wise to call it a day and come back after the weekend when there would likely be fewer hunters in the woods. I had made a large loop through deep woods and was heading back in the direction of my car as I approached a large clearing. Suddenly there were two deer, right on the edge of the clearing, no more than sixty feet away. I looked at one through my scope and saw antlers. They had seen me at this point so I quickly shifted my aim and shot. That deer took off and disappeared from view. The other ran a dozen feet and stopped to look at me again before taking off. I ran forward and couldn’t find a blood trail where that deer had been standing. I was sure I couldn’t have missed at that distance so I started a search. I couldn’t find a trail in the direction he ran, but it only took a couple minutes of searching before I spotting him laying just inside the woods about seventy feet away from where he was shot. I ran over and offered a prayer of thanksgiving to Mother Gaia for providing me with this bounty to feed my family. My circle of friends call this spiritmeat, and wild game meat is always treated with reverence. After field dressing and bagging the liver to carry out to the cooler in the car, I hiked out to get my game cart. I passed another hunter on the way. When he saw me pulling my cart, he followed and asked if I would like some help. This is common practice, even among hunters who have never met before and the help is always appreciated. 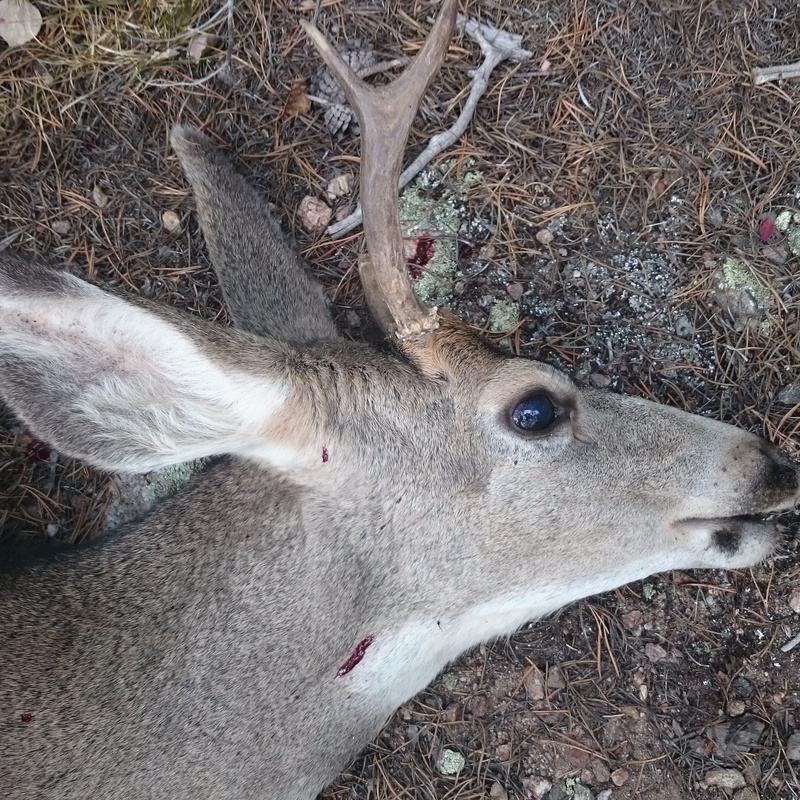 My first meal from this buck was fresh liver. The garden is winding down and we covered it two nights ago from the first frost. There are still a few tomatoes and lots of tomatillos and peppers still in the garden. Our fall cool season crop has started adding lettuce, spinach and mustard greens as well as pea pods, shoots and leaves to our daily salads. 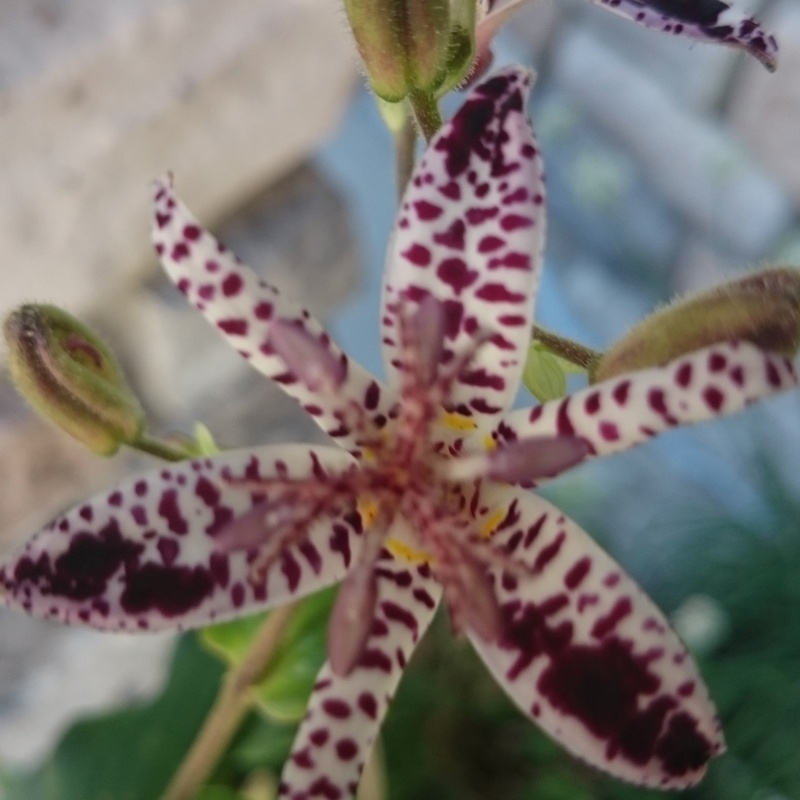 The flower pictured above is a toad lily. We came across this while looking for plants to put in Cathy’s flower garden last spring. We couldn’t resist pictures of the flower which described this as a fall blooming perennial. The flowers are small, only a couple inches across, but is has been blooming prolifically for several weeks now. We are still harvesting plenty of kale, rainbow chard, radish roots and greens, parsley, chives, carrots and basil from the garden for our salads and hope to continue picking salad greens for a while. It has been a good year in the garden and our freezer is packed full. Next weekend is elk season. If I bring home a bull, we will need to either buy another freezer or trade some meat to a friend for some storage space. The weather has been delightful with pleasant days, cool nights and we recently received some much needed rain. It would be nice to get a little tracking snow in the high country where I will be elk hunting in a week. Based on long range predictions, it may happen. Knowing we have a plentiful supply of vegetables and venison in the freezer, the pressure may be off, but bringing home some elk meat would be a delightful bonus to this beautiful fall season.